Less than a month ago, Bill Thompson called Bill de Blasio “Bill de Bliar” for being disingenuous about the public advocate’s record on term limits and positions on stop-and-frisk. This morning, the two raised grasped hands with Gov. Andrew Cuomo in front of City Hall as Thompson bowed out of the heated race to become the Democratic nominee for mayor. “Today, I’m proud to stand next to a great New Yorker and throw my full support behind him,” Thompson said as he pointed to de Blasio and asked his own supporters to do the same. He said that de Blasio would carry forward a progressive vision to City Hall. Thompson’s wife, Elsie McCabe Thompson, stood close to Cuomo and in front of a bevy of Thompson supporters who joined the former comptroller and 2009 Democratic mayoral nominee. They included United Federation of Teachers President Michael Mulgrew, American Federation of Teachers President Randi Weingarten, Rep. Gregory Meeks, Rep. Charlie Rangel and others. Cuomo struck a conciliatory tone, emphasizing the display of unity at the press conference, praised Thompson for his years of public service and applauded him for his willingness to unite behind de Blasio. Cuomo avoided weighing in on the Democratic primary before today, only coming to de Blasio’s defense when Mayor Michael Bloomberg called the public advocate’s campaign as racist. Cuomo called those comments "unnecessary and inflammatory." Yet Cuomo — who de Blasio worked under during the Bill Clinton administration — did not endorse before Sept. 10. Today, Cuomo loudly celebrated the primary outcome. Now that he has avoided a runoff, de Blasio’s campaign will turns its energies on his Republican counterpart, former MTA chief Joe Lhota, who on primary night signaled that he expected to be running against de Blasio in the general election. De Blasio has yet to convince all of his former rivals’ supporters to join him. Detectives Endowment Association President Michael Palladino stood at the sidelines today to watch Thompson’s concession to de Blasio. Palladino helped create the Uniformed Workers of New York City during the primary, which endorsed Thompson. Today, he’s unsure if the coalition would follow Thompson to Team de Blasio. “We have no endorsement moving forward, not yet anyway,” Palladino said. The coalition will reconvene, he added, to look at the full field of candidates to see if they’ll weigh in as a united group or splinter off their support between the remaining candidates for the general election in November. But he said both the coalition and his own detectives union are open to hearing from all the candidates. 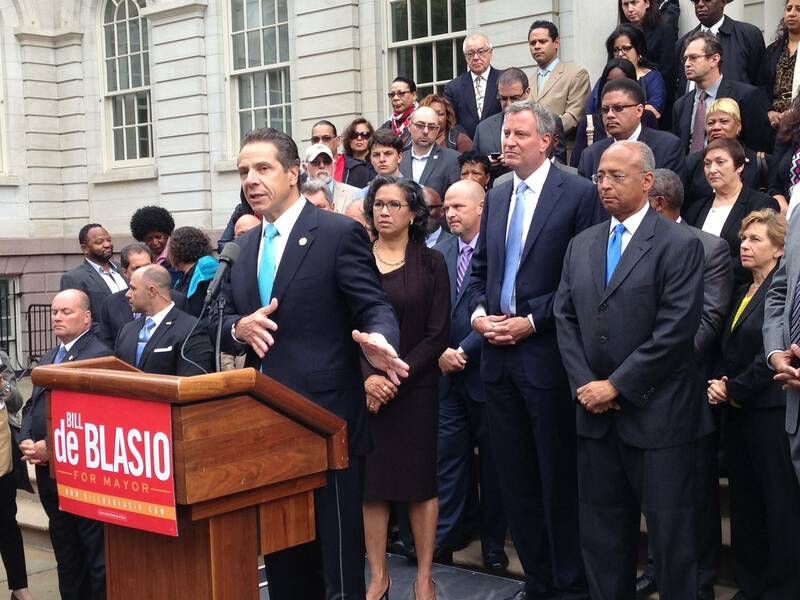 As of today, Palladino said that de Blasio has yet to reach out to the coalition. Lhota, however, has reached out. De Blasio didn’t mention Lhota during his address today, nor did he take any questions from press. Instead, he thanked Thompson and Cuomo, and said he was humbled by their support. “In this city and in this party, there’s no man of greater integrity,” said the newly crowned Democratic nominee of Thompson. De Blasio said he shared a Democratic vision of New York with Thompson.